Picture the scene: your attendees walk into your next big event, expecting to be faced with the run-of-the-mill lighting and decor they’ve become so used to. However, upon entering, they’re faced with a world of colour, texture, and forms, which leave them wide-eyed and open-mouthed. Such is the effect of projection mapping; one of the latest trends in events planning, which is opening up a world of possibility for immersive experiences, audience engagement, and providing a truly unique and impactive ambience. 3D projection mapping is massively impressive, and it’s no wonder it has taken off in such a big way on the events scene. It’s a technology which opens the door to so many options, and allows event planners to take their themes and colour schemes to new heights of wonder and fantasy. Want to transform your events space into a jungle, complete with waving leaves and chirping crickets? 3D video mapping is a versatilely usable visual element for a wide range of events (from building mapping to car launch shows). Fancy turning your venue into a star-studded galaxy of celestial bodies, or to be filled top-to-bottom with video imagery of cityscapes, island paradises, or anything else you wish? 3D projection mapping and events projections make all this possible, and allow for incredible levels of creativity to be realised in real time. At Ultimate Experience, we’re always keen to share our favourite developments in the world of events with our readers and clients. That’s why, in this article, we’re going to be taking a closer look at projection mapping, considering what it is and how and why it’s taken off in such a big way in the events industry. We’ll also be taking you through some of the most impressive examples from recent years, and discussing some factors to bear in mind should you wish to bring this sensational new technology to your next event. Want to find out more about this genuinely exciting new trend? Read on, and discover a world of possibility! Simply put, projection mapping involves the use of technology in order to project images or video onto a surface. It’s been a common tool in theatre for decades, and it’s also proven to be popular at outdoor events, where images are frequently projected onto the outsides of buildings. In the events industry, however, it’s used to create a visually stimulating, immersive, and engaging environment for your attendees to enjoy, and it adds an extra sensory layer to your space which can be incredibly exciting and beautiful to explore. Give your attendees something to really remember (and fill their social media walls with), by replacing blank spaces with a cornucopia of colours, thematic displays, or immersive projected landscapes to wander through. The potentials of projection mapping are many, but one of the clear benefits comes from encouraging your attendees to actively interact with the space. Want to increase your ROI by boosting your event publicity? Promising incredible audiovisuals is a sure-fire way of ensuring this happens. If you want to see your follower numbers take off, and see Instagram fill with shots from your event, using projection mapping can make a massive difference. Who wouldn’t want to share photos of your amazing, projection mapping-filled events space? This anniversary event in Singapore saw the city pull out all the stops when it came to decorations and spectacles, but few caused more buzz on social media than the the 3D projection mapping event in the very centre. 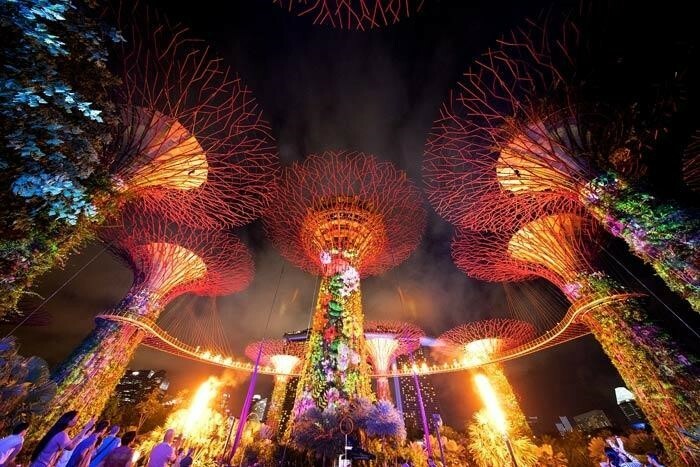 Asia-based Hexagon Solution constructed a series of 165 foot ‘supertrees’ - vast structures onto which 120 light fixtures and 24 flame projectors were attached. The projection show lasted for twenty minutes, and saw the supertrees come to life with incredible displays focused on geometric patterns, floral displays, and local art. The Christmas festivities in the city of Norwich saw projection mapping come to town in a big way. The imposing edifice of Norwich Castle was illuminated for the evening by a series of artistic impressions, animations, and other images which interacted and transformed the building beyond recognition. The result? People from all over town were drawn to the centre, and were encouraged to get involved with the celebrations. When you have an events space as big as an airline hangar, you’ve got plenty of room to play around in when it comes to a truly staggering projections show. Southwest Airlines really showed us how it’s done with 35,000 lumen projectors, which brought their hangar to life in the world’s first 3D/4D projection encounter in such a space. The thousands gathered were blown away, and Southwest Airlines social media presence skyrocketed overnight. Edinburgh is a beautiful city at the best of times. 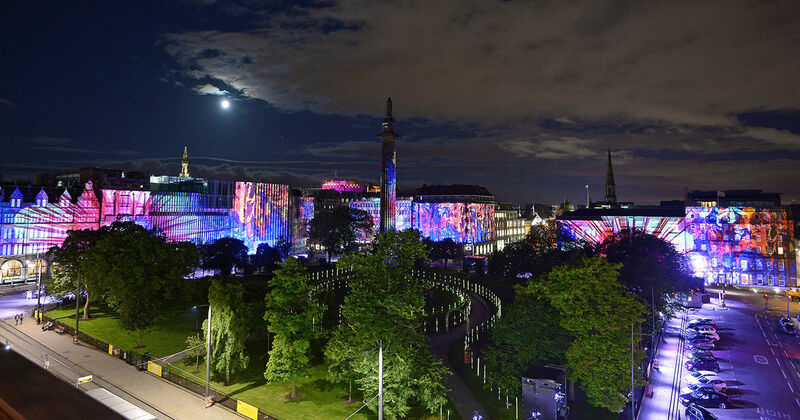 However, for the 2017 Standard Life opening event, it was shown off in a way it had never been before, with the entire of the city’s central square being illuminated by moving projections, which brought the ancient buildings, pillars, columns, and statues to life in a riot of colour and rhythm. ​If you’re already hooked on the idea of using projection mapping for your next event, we can hardly blame you; it really is an incredibly impressive feature, that has the power to make your event a real hit on social media. However, before you dive headfirst into the world of event projection mapping, there are a handful of things you’ll have to think about first. Projection mapping certainly looks expensive - that’s part of its appeal. However, it doesn’t necessarily have to cost an arm and a leg, and can be done on a relative tight budget so long as you’re savvy with your AV company, and rein in your ambitions a little bit. If you’re concerned about your budget, either shop around for a more affordable provider, or be clear with your AV company exactly what you’re able to afford. A good provider will be able to tailor their services to fit your budget, and let you know just how much your available cash will be able to get you. Generally speaking, the bigger your space, the more you’ll have to spend on projectors to create a truly immersive experience. Smaller venues are more manageable in this regard, but also lack the visual impact achievable in a larger one. It’s important to remember, however, that you don’t need to fill the entirety of your space with projections. In fact, often less can be more, and smaller areas highlighted with 3D projection mapping can look great. Just look, for example, at how cool the duct projections looked at a recent Unilever event - elegant, intriguing, and a fascinating way of adding a dynamic to the space. It’s also worth thinking about the spaces where most people will be and will congregate, for example around the bar or bathrooms, and using those spaces as focal points for smaller event projections. It’s a common question asked by events planners: would it be better to do things in-house with the budget and skills you have to hand, or bring in a professional from outside? When it comes to projection mapping, this is doubly pertinent, as the technology is becoming more commonplace, yet there are still specialised companies who might be able to do everything more efficiently and spectacularly. Bear in mind that there are relatively simply ways to do DIY projection mapping, if you feel up to the task! Let’s take a look at the benefits of each side of this particular coin. There’s no doubt about the fact that 3D projection mapping for events has become something of a highly desirable feature, especially as event attendees become ever more demanding, and have ever-higher expectations. There’s also no doubt about the fact that when it comes to achieving that ‘wow factor’, few things tick all the boxes in the way that projection mapping does. Here at Ultimate Entertainment, we’ve been massively impressed by the projection mapping we’ve seen at events across London and the rest of the UK. It’s a feature that truly adds to the flow of the event, and enhances the overall experience of everyone in attendance. We’re always striving to stay on top of the latest developments in the world of events and event planning, and projection mapping is just one example of the kind of things we can bring to an event like yours. Want to know the rest? Just get in touch today, and find out why Ultimate Experience are a top-notch provider for all your events needs.